materials: magnesite, cement, cork, fishing line, electric lights and acetate on wood mount. dimensions: 34.5" high x 24.75" wide x 7.9" deep. Lunar Landscape is elaboration and development of his earlier model for a work of land art entitled This Tortured Earth. The implicit suggestion of the earth's surface serving as a metaphor for a body's flesh in that work becomes more specifically and graphically anthropomorphic here. In Lunar Landscape identifiable elements of human anatomy including such gendered attributes such as a woman's breasts, a pregnant belly, and a male phallus. Colored light emanates from a series of slits in the surface of the work: a long thin slit across its top (perhaps suggesting a vaginal opening) as well as two diagonal slits across the protruding belly. Noguchi employed colored acetate to achieve the effects of colored light (red, yellow and blue) from these cuts into the surface of the work giving the impression that the colors emanate from within the body of the land itself. The horizontal phallic element across the bottom of the work projects a clear white light back onto the surface. This element reappears in several of Noguchi's lunars. In each case the form projects outward from the surface and shines light back onto the surface creating a intensely back lit form silhouetted against strongly reflected light. 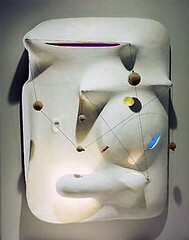 It seems that a key aspect of Noguchi's concept of self-illuminated works of sculpture as "lunars" involves the reflection of light from a hidden source (just as the nighttime illumination of the moon glows with the light of the unseen sun). Noguchi's suggestion that the surface of the work is comparable to the surface of the moon (or the earth) is supported by the small elongated divot on the left side that seems to have been caused by the impact of a ball-shaped object (such as an asteroid). The suspended cork spheres suggests such satellites, moons, planets or other such bodies in motion. These spheres hang down from points of support projecting from the work's surface. They simultaneously suggest orbiting heavenly bodies while hanging distinctly downward reacting to the pull of gravity since the work is mounted vertically to a wall. This piece would not work properly mounted any other orientation. It certainly would lose its effectiveness if positioned horizontally as a kind of "table landscape" as some of his other landscape works of the period where after being cast in bronze (i.e., Contoured Playground of 1941 and This Tortured Earth of 1943). While the connection between Noguchi's personal life experiences and his motivations for producing works of art may not correspond in a direct, explicit manner, it is difficult not to interpret his work in the context of his life's experiences. Some critics have argued strongly against such a reading of the critical themes of an artist's life in their artworks, however, Noguchi sometimes explains his work in exactly those terms, at least as part of the implicit context of and basis for interpreting his work. Works such as My Arizona and This Tortured Earth are both explicit reactions to his experiences during World War II. The former work relates to his time as an internee at the War Relocation Center in Poston, Arizona in 1942. The latter work was specifically prompted by a photograph of the destructive impact on the earth of aerial bombardment in North Africa. Lunar Landscape of 1944 seems to be a development of the forms and ideas begun in those two works of 1943. All were made from magnesite cement and offer an abstract interpretation of the earth in sculptural terms. The memory of Arizona (Internment Camp, 1942) was like that of the moon, a moonscape of the mind . . . . Not given the actual space of freedom, one makes its equivalent -- an illusion within the confines of a room or a box -- where the imagination may roam to the further limits of possibilities, to the moon and beyond. -- -- Isamu Noguchi, A Sculptor's World, 1968.
mental protection from the harsh realities of racism and militarism as he found in all of it's raw feelings of pain and sorrow. He enjoyed imagining of worlds beyond the earth (often directed toward the lunar surface) a place without the difficulties and horrors of the real world.